First create an account and then join the conversation! The Hot Seats continue to be public, open and free for anybody who is interested in Networked Learning. Feel free to share the Hot Seats within your networks. January 24-30, 2016 Don Passey will facilitate the January Hot Seat: Doctoral Studies in Networked Learning? March 13-19, 2016 Jim Groom will facilitate the March Hot Seat: Clouds, Containers, and APIs, Oh My! The discussions on MOOC, and more particular their pedagogies in relation to social learning and conversations have just started, and the arguments are already triggering interest (relations to educational philosophy, complexity theory, informal learning, agencies of learning, engagement versus learning...). Y.L. Teresa Ting from the Universitá della Calabria (Italy) has an Italian charm and looks fabulous as she takes the stage. Today she focused on the question on how the CLIL format can answer the many challenges of educating pupils in a foreign language, especially if one takes into account that the outcomes of native language courses keep having flaws. She is also clearly a teacher, narrating, yet paying attention at our focus, and she makes us do things (takes me back to the classroom).I was following with pleasure, until the sentence "students need good textbooks more then ever, as you never know what they will find on the internet" - okay, just imagine my face when hearing that sentence! Fun though, and the full keynote was definitely of interest. . Throughout her keynote Teresa used notes to illustrate how students and teachers think. She put these sources online for those interested, to be found (google drive docs) here. She opens with OECD skills outlook 2013. Where she refers to the challenge of literacy … how can instruction through a foreign language help. What makes up great learning? One thing occurred in all classrooms, if teachers help see learning through the eyes of the students, and students see their learning through their own eyes. Nobody likes to learn content that they did not choose. 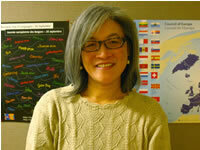 Teresa Ting started off with starting English in Italy, while actually being a neuroscientist. Around 2000 Teresa was given the opportunity to engage with CLIL. Evolution is a very conservative process, as such the brains of rats are comparable to human brains (Teresa first researched rats and learning). Brain Reward System: part of the brain where rats would feel really good. It is part of the primitive part of the brain. Rats will press the stimulus until they are dead, omitting eating, drinking… Similar with human brains. When brain surgery is done, this part in the human brain is stimulated. Motivation is already embedded in the brain, it is there, we (as teachers) only have to activate it. The big question: the point is: can we activate these pathways of motivation? C1 level English as foreign language => implications that might be a problem. In 1980 in the Anglophone ex-colonies science was given in English. Teachers did most of the talking, but learners kept quiet and did not understand most of it. So the risk of C1 competences means that teachers => transmissive education. In Italy the teachers do not speak, so they have to come up with different learning activities, AND the material will become easier, though aimed at reaching the learning goals. At a given point during the presentation, Teresa gives us exercises to illustrate what learner-centered teaching with little input from the teacher is like (Inge note: very similar to cMOOC). Then Teresa also illustrates the complex language use that occurs when learners are left to their own devices (or at least, when they are given more freedom). Teresa refers to Lexical Density (Inge note: look up the tool you used for easy English, you used in MobiMOOC the Fog or something scale?). With disciplinary expertise, the disciplinary literacy needed increases. Bourdieu and Passeron, 1977: academic language is no one’s mother tongue. But disciplinary discourse is the most precise way of speaking (community language). But the language of the community must be mastered. (disciplinary discourse), if you cannot do it, you have not learned the content yet (not mastered it). The challenge: the discourse student should output to show they have learnt cannot be used as input for learning (Ting, 2015). Because if the language is too difficult (difficult), this is not picked up. Working memory scans the environment to see what kind of information you need to pay attention too (short term memory). In a classroom you want to move from short term to long-term memory. But working memory is volatile, limited capacity (5-7 digits), limited duration (only seconds). To get into long-term memory, it needs to get attention, it needs to be attended to. Working memory overload even in the mother tongue, good teachers are aware, but must be aware of this risk of disciplinary language for 50 minutes. This is why Teresa creates tasks: transforming texts into task, which follow a learning progression. (Inge note: parallels contextualized learning ). Learning content always embraces two parts: the content itself, as well as the language which describes the content. If content is difficult, the language must be easy; if content is easy, the language can become difficult. Which is a way to be aware of working memory. An option is assessment of learning for learning (see exercise 3 of the prints provided)… seems like cMOOC. 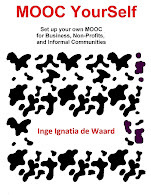 Inge note: In the CLIL-MOOC: Big macro content –learning is cut into little content pieces (eg. What are the elements of MOOCs, and what can we do with these elements, and do it). This is assessed, and based upon feedback, new iterations are provided, as well as reflective moments (progress diary). Problems provide dilated pupils with those humans solving the problem, as soon as the problem is solved the pupil undilates: so it is a physiological response. The brain likes solvable problems. Haptic tasks: proprioceptive feedback also stimulates synaptic grounding. Semantic incongruency: this alerts the brain, but it is not positive thing. Such information generates "distraction" and therefore is not easily processed. This points to the message that academic text is full of semantics which are incongruent with how we usually use our mother tongue. Which is why academic text is not a good source of input for learning - but an essential source for reference. Priming: is a way to prepare humans for what is to come, and orient the brain (eg, being able to think whether what follows will be difficult or easy – cfr advanced organiser). Important factor for language learning: we need to use a whole language approach to increase academic language and disciplinary discourse. Providing holistic language to increase contextualised grounding of the language. Input must be whole language, tasks must be whole thoughts to make an impact. Teresa said: students need good textbooks in this day and age to increase their core concepts and details, as well as academic discourse. So here it is: if you ever had an idea about writing (making use of whichever digital media, and for an idea that can be either big or as small), this is the moment to test it out. It is simple and open. 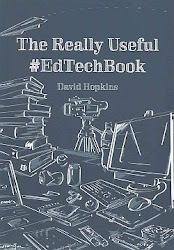 My addition to #DigiWriMo: I will be able to test out a strand of writing that has been sitting in my mind for months: imagine future daily life, and connect it with current digital, learning options. Breadcrumbs from here to the future... To prepare I am listing a number of topics already... oh, nice initiative! There are no secrets to doing DigiWriMo, no right way and no wrong way to do it. Some people may write a novel using their computer and call it a day; while others may write hundreds of Twitter haiku. The key to success is your imagination and your love of experimentation, exploration, and fun. Along the way, check out our regular prompts and guest posts for inspiration. Prepare to join the fray! Beginning on November 1 at 12:01 UTC, post your goals for the month on our Roster. This will help you connect with others in the DigiWriMo community and keep on track! Join in wherever you like: Because digital writing takes place everywhere on the web, so will our discussions. Plan to join our regular Twitter chats using#digiwrimo, head over to our Facebook page, or participate in the DiGiWriMo Google Community, and visit this site often. All the Digital Writing Month writing prompts and special challenges will be posted here. Live notes from a great workshop on basic and easy Mendeley use by my OU/PhD colleague Janesh Sanzgiri. In this workshop Janesh highlighted the most useful Mendeley functions, and how to use them in Word. 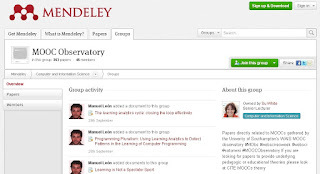 He likes Mendeley as the files are stored in the Cloud, which allows you to access your account across all your devices as well as access it from internet-connected computers wherever they are. And Mendeley is also seen as intuitive. 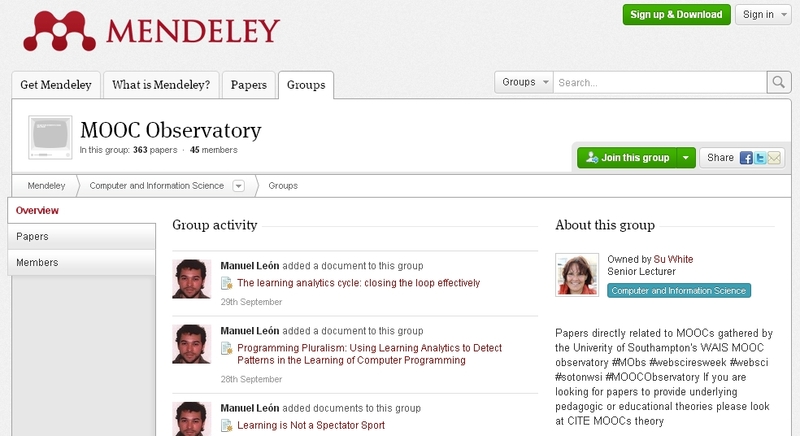 Overview of Mendeley use: off and online (important: use the sync button to sync all your devices). Import a file in Mendeley to Mendeley’s ‘Watch folder’ (this will automatically put the pdf’s into that folder, enabling quick structuring). The default folder for downloads can also be made the dump folder for all your pdf’s. So, each time you download a pdf, it will upload it into your Mendeley account (if you sync it). Always check meta-data, so always check the meta-data. As meta-data is the primary tool within the reference management function. Once that file is okay, it is durable for the rest of your research journey. Important for the library management purpose: add tags that are meaningful for you. Separate tags via comma or semi-colon. Additionally, you can use folders per theme or topic. Mendeley does a full search of any word you might want to highlight, it goes through the full text of all pdf’s. You can do this by choosing ‘documents’ and put the search word in the search box on the right top side of Mendeley. Annotations in the pdf’s are most of the time possible (not available in all pdf’s), but for those who do allow annotation, and add notes. Cfr memo’s. In Mendeley go to ‘Tools’: install MS Word plugin to really use the reference managing tool. This will make it much more automated, instead of manual labour. BUT provided all your meta-data is in place. In MS Word, you can go to the ‘references’ tab in the main toolbar. At the same time in Mendeley go to ‘view’ in the main toolbar of Mendeley, then choose the ‘Citation style’. You can always change your citation style in order to comply to the guidelines from the journal you are writing for. Then click Alt + M and you need to click on ‘refresh in word to switch between citation styles. How to do it: type the text, click Alt+M, type in the author, and choose the right pdf. That will add the author/s to the paragraph, as well as add it to the references. Put any new author in through the author name and year, BUT you NEED to keep that basic citation in if you do not want to lose the full reference in your reference block. The success depends on your meta-data. The MOOC observatory (Southhampton, owned by Su White ), these academics tagged a lot of MOOC references. You can link to these networks. But if you link to those networks, you get a list of references, but not the full pdf’s. So if you want to get the full pdf, go to the network, scroll and explore the meta-data of these network references and find the full paper. You can also build private groups, but that is more for the premium model. Link to the Mendeley guides for lots of devices. 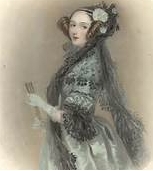 Most of the people who are passionate about computing know Ada Lovelace. Born 200 years ago (1815) her family background provided a mix of poetry (father) and mathematics (mother). An interesting mix, and I feel a necessary mix for great achievers. Being able to feel the dream-state of creativity, allows a different interpretation of the material, realistic world. 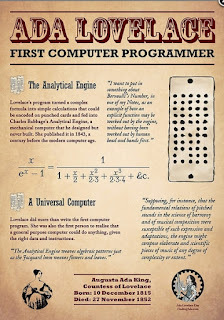 I truly believe that there is no great invention without great creative vision, and to me Ada Lovelace had both traits which resulted in a magnificent addition to history, even today. There is a lovely FindingAda blog which celebrates the achievements of women in STEM. And today I loved reading the 40 years in tech FutureLearn blogpost by Shirley Williams. Going against the odds is not an easy thing. Anyone who is slightly different understands the impact of not being part of the norm. Ada must have known and felt it herself. Nevertheless, she had one big advantage, her interests paralleling passion that she could find close by, she had access to an incredibly professional learning network (admittedly, that would have been a very physical, face-to-face network at the time). It was Ada herself who described her scientific thoughts as ‘poetical science’. But what did she do? Ada managed to translate the operations of a machine, the Analytical Engine. She literally translated the Italian description of the analytical engine, but added her own notes to it: “Sketch of the Analytical Engine, with notes fromthe translator". These notes are the blueprint of computer programming, and moved the machine beyond its mere materialistic capacity, towards a new use. It is this that has fascinated me about Ada (and more people with similar poetic scientific passion). Within this day and age STEM (science, technology, engineering and maths) is of course still very important (history tends to have waves of interest, so STEM is bound to become less important in future historical era’s). And I love the fact that STEM is stimulated from a gender perspective. 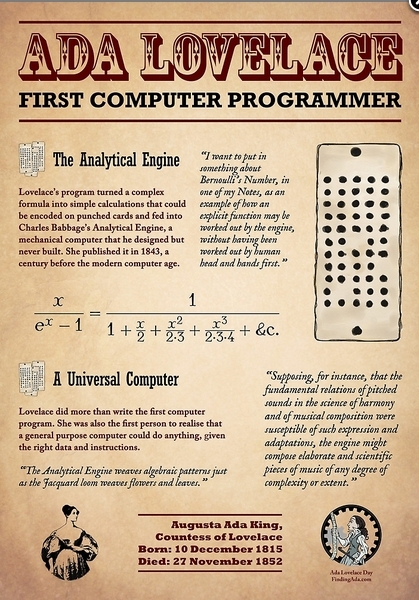 But it does make me think about what I feel we are missing, when thinking about Ada Lovelace? The best action movies are those where the actor/actress has to come up with new solutions ad hoc. A bit of MacGyver or the A-team… but with more women as heroes. This is what seems to be missing with a lot of algorithms. This: what if we hit a brick wall? Where do we turn next.... That is what I would love to see: more algorithms that can multi-iterate solutions. The reason why is because of the current dysfunctional learning body I have to live with in my digital world. I would love to see my digital, extended body to be equipped with a more solid network of solutions, allowing me to stay ‘in the flow’ when I am learning. I am looking for the new Ada that solves STEM affordances, translates them ready for use in our extended, learning body. No matter what I do, I always seem to hit the brick wall of affordances multiple times. Even the more mature technologies can cut me off unexpectedly. Three days ago I was typing along, coding various data sets using DeDoose cloud software to code qualitative data. Suddenly I felt like my arms dropped off. Physically they did not really disappear, but it felt that way. I was using the internet, wanting to search for something and … the connection broke. I felt like being at a library and suddenly losing the ability to use my arms. I know the library has the books I need (the internets), I even remember what isle to go to (structured search engines)… but I cannot reach them myself. So I did the only thing I could do… stare and hope for my digital arms to reappear again. I had similar experiences when exploring mobile learning, or using mobiles for learning, in the past. Or building mobile apps to be able to connect with digital, cloud-or-file-based content. Of course coping with an extended, digital body means that multiple factors need to be part of any problem-solving algorithm: time management, what we mean with ‘flow of learning’, what provides the best possible experience of ‘learning flow’ (is it rather staying connected (for instance having an offline library that can step in with some bits when internet fails) or is it working with some sort of latency which can bridge failures in connectivity? Or anything that we can come up with.). What affordances do we feel as useful? The first PDA was build based on real life experiences of its inventor walking around with a log. Affordances are in many cases ‘that what we find logical, or natural’, but it could be that what we find natural is not natural at all, simply something that works best given its realistic boundaries. What feels natural is not always transparent. What kind of notes would Ada Lovelace add to a description of the extended learning body that we know have? Using social media, multiple (mobile) devices, connecting with people, learning in both formal and informal ways, moving towards an unknown professional future….? What would she come up with? Where does it leave me? How much of an Ada would I like to be (given my own personal boundaries and passions)… Where do we all see each other? #Teacher contest: using innovative practices in your classroom? Enter! My wonderful PAU education colleague Maria Perifanou just sent me a wonderful contest for all you primary and secondary teachers (in EU). The Open Education Europa portal has just launched a contest aiming at collecting and sharing innovative teaching practices taking place in Europe. Just sharing the information from the platform here. From my end, I am going to ask my GUSCO colleagues to enter (one or three wonderful teachers working on the integrate MOOCs in secondary school classrooms to increase lifelong learning skills). Otherwise you will not have access to the submission form. To fill in the template you need to describe the project, who was involved and give a summary of why it was innovative, inclusive and/or open. Prize: visiting one of the leading innovative schools in EU and recognition, as well as the fact that your best practice will be shared throughout the EU. Innovation; the application of a novel approach, method or resource to improve teaching or learning. Openness; the use or production of resources that are shared freely; the opening up of the classroom with open educational practices. Inclusion; providing access to education or training to a previously excluded group or audience. For the contest we will also consider the Replicability of the practice; whether it is easy for colleagues in other countries to apply and adapt the practice. Everyone taking part in the OEE Teachers Contest will receive the “Open Education Europa Pioneer” badge and have a chance to win a trip to an innovative school in Europe. We invite innovators from all all disciplines, fields and levels of education who use successfully various approaches and resources to share their good teaching practices until October 31th, 2015! We are looking forward to meeting you online and learning about your successful practices! Sitting in a train heading for The Open University on a rainy day in September (Autumn in the Northern hemisphere). Writing a progress log or Plog as Jay Cross would call it, and it took me ages as I struggled with the use and application of assessing new knowledge. In some ways this plog relates to discussions on the use of testing/assessing which is a reoccurring discussion in education everywhere and online learning in particular. I suddenly wondered how intuitive assessing one’s own knowledge really is. What we do with new ideas? Do we just apply them, do we test them in safe environments first before implementing them in real life, do we Just Do It and test new stuff live as we live it … What would be my take on assessment and its place within real learning? At the end I realized that if my aim is to increase lifelong learning skills, my assessment methods should push me to point my vision towards my (wishful) future. 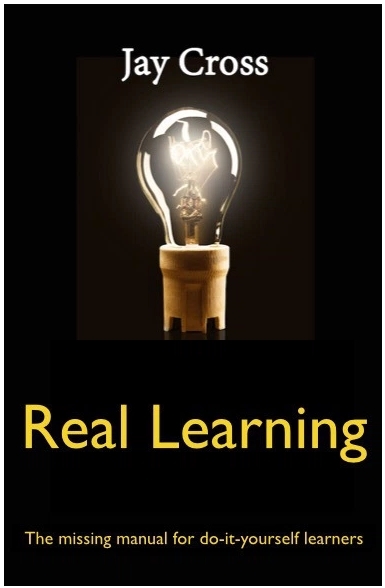 The new book on Real Learning by Jay Cross has kept parts of my brain busy over the last couple of weeks. It is essentially a book for those that want to change their lives towards new or adjusted goals through learning (professionally and/or personally). Jay Cross kindly asked me to furnish him with feedback on a beta version of his book, and of course I gladly accepted the task. At present I go through the book at a slow pace (kid sick, working on PhD, dream, getting some rogue research planned and described, being me). But despite my slow pace (or is it because of it?) the book seems to stir my mind on subjects I found straight forward in some ways, and makes me wonder whether they are as straight forward as they should be. The latest idea that I got questioned whether power learners (with which I would describe those people who reinvent themselves every few years, or people who read the book and put its suggestions into practice) need to self-assess their newly acquired content or whether that is taking the learning out of its organically formed or natural ecosystem: the growing, living mind. Is assessment in any way a natural phenomenon? because those who build a course want to have some kind of measurement or grading tool to see whether the new content/action/practice has been understood (or it has lead to obtain a learning objective). This prompted me to suggest that the Real Learning book might possibly cover an overview of ways of self-assessing newly assimilated knowledge. So I posted it that suggestion to the executive group forum of the book, to add my two cents worth. As soon as I posted my remark, I could feel something was wrong with it. It felt like a dinosaur statement and I could not figure out why at first. Assessing knowledge seems impossible within its own confinement. As I was thinking about it I got the idea that assessing knowledge is only useful when it takes that knowledge towards a new future. It does not reflect on what is learned, but where one wants to take it. 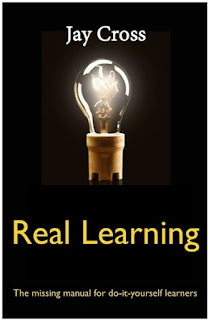 Informal learning, or adult authentic learning has little use for the past, it needs to be useful in the present (for sure) and the future (possibly). Tracing my own learning, I can honestly say I do not build external architectures of ecologies to test my own new knowledge. I just venture out into the real world and implement them. It might be an intuitive action, it might rely on previous knowledge, never the less it is moving forward. Additionally, I feel that assessing new knowledge is part of a very personal action. The personal constructs the learning. Learning is a very personal action: what we learn, how we learn, the reasons we learn, … and how we then use what is learned. Research literature is littered with the adagio that we connect new knowledge to the old knowledge we have acquired… but this is highly personal. The way we all think, our philosophical frame, our hopes and dreams make up our thinking. Again a central question comes up: can we really uplift people universally through the process of learning? Does it benefit the world, or is it just a simple natural process that furnishes a sense of accomplishment? Can assessment take us to a more human level of thinking? A type of assessment which fits our own goals, this means assessment should have an element of future enabling in it… which means it must be made generic, enabling contextual solutions and - no matter what - it will be implemented by the person, in her/his vision. I do not assess consciously? While reflecting upon my own assessment iterations, I realized I do not consciously assess anything I learn. But on an unconscious level I do implement new stuff I learn. So suddenly, while racing ahead within the Virgin express train I realized that from now on, the only assessments I will make or take would be those that take me to the next level. Because that is the only real life situation. It also prepares for lifelong learning. There is no use in assessing only what is seen, it is much more useful to see whether one can apply new knowledge in a personal, as such contextualized setting. Every course or training I took that demanded contextualized responses always pushed me forward. In a way I guess that what I will do from now is use assessment purposes to ask learners to build their own advanced organizers for the next bit of content they want to assimilate and turn into authentically useful knowledge. 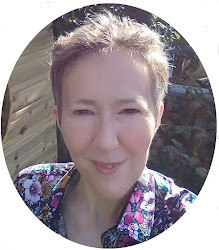 This CIDER webinar will outline the design and delivery of a MOOC with a difference where facilitators encourage MOOCers to participate in discussions, share knowledge and experiences, and to network beyond the duration of the course.. The LTLO course embraces a "learn by doing" philosophy providing participants a variety of fun and effective learning activities. The course is a mixture of directed, self-paced and community of inquiry (COI) learning environments. Components of typical online courses will be discussed and applied throughout.